Discussion in 'Videocards - AMD Radeon' started by Trenchdog73, Feb 7, 2019. OnnA, Embra, Passus and 3 others like this. Its rumored to only be a stock of just over 100 for the whole UK, while Spain and France get just 20 each. If true, it will be much much worse than the crypto craze in its worst. I got an order in no problem. they were in stock for about an hour or so from the time I posted. honestly having a slight buyers remorse at an impulse buy but I supposed I can always send it back lol. Did they really sell for only $600 and 12 hours early? At that price I'd have ordered for sure! This is hilarious: $599.99 and sold out. Seriously! I wish I'd have known! $700 was just too high for me to switch from my 1080Ti, but $600 shipped with at least one game I'd play seems awesome. Wonder if that was a mistake or if they'll come back in stock here or anywhere at $600. OnnA and Embra like this. It's probably a total of zero over here. Looking at stores here Vega 56 and 64 are still going for around 700 - 800 US Dollars though I can't find anything about VII so it might be pretty close to no stock at all. EDIT: 7499 SEK for the MSI Airboost Vega 56 which is basically the stock model with a bigger grill or vents on said grill. Around 810 USD. EDIT: Ah I see the pricing is still wonky here in some stores. 7 and 4 V.56 MSI AB OC. That's probably why the pricing is all over, thought that would have been corrected in 2018 when the mining craze somewhat slowed down, seems that didn't happen so now the GPU prices are all over the place. Still no sign of VII either. Guess I'm not using that to compare pricing with just yet. Vega 64 has been under 500 euros for a while (VAT included, of course) and Vega 56 under 400. Like Sapphire Nitro Vega 64 is going for 469 euros. Nobody should pay anything more for them, old cards as they already are. If you see higher prices, they are just stray, old cards stuck in some shop's warehouse ever since the mining craze. The store hasn't yet bothered to update prices to try to get rid of them. Hmm, according to prisjakt.nu you can get V56/V64 far cheaper than that. 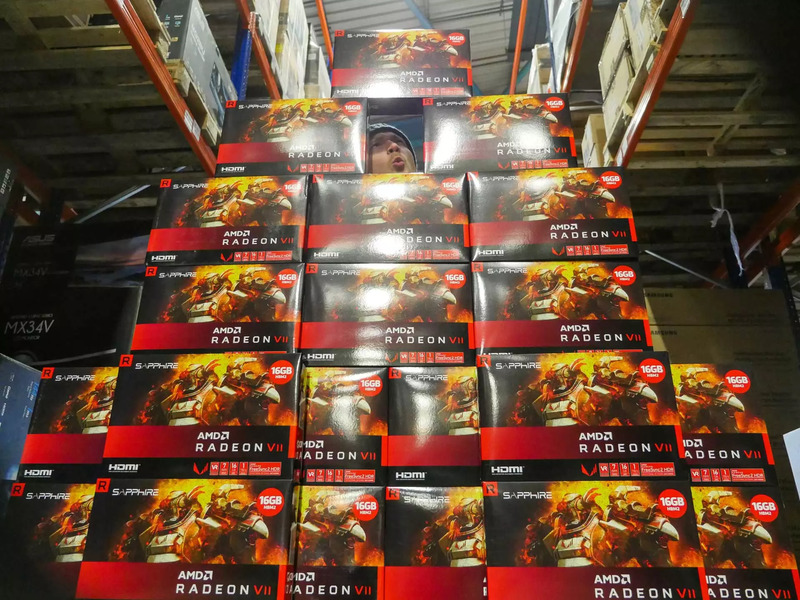 But yeah, no Radeon 7 listed yet. Though I wouldn't expect that to happen until we hit the review embargo time, which should be later in the day. Regardless I don't expect a huge stock, which would make sense as it's not exactly a huge market. What a surprise $599. I wonder if that will stick though. Venders will surely look to profit if demand is there. Yeah there are alternatives though there a lot of remnant entries from back when the price hike was in full effect too, shopping around and using comparison sites such as Price Hunt (Pris Jakt) helps in finding a store with both good rep and hopefully also better pricing. These are also often older cards often sitting at the last batch in stock so no-one really bothers updating them unless it's a discount sale or similar though Vega is in a curious spot now with availability diminishing somewhat and the VII replacement for the high-end bracket having limited availability too but then this is launch day and the next few batches of shipments should hopefully be higher outside of the major countries in Europe or even the major store chains and retailers. Less mining craze now too so no weird pricing aside from what the retailers themselves try to get away with but with the mining boom lessened that should hopefully also not be too bad though I still expect a straight USD to EUR price conversion and then for Sweden in particular hardware prices can be pretty varied. Didn't know the embargo was still in place, thought it had expired already but I suppose not though it's expired by this point. Will re-check during the weekend and see what's up, I am not really in need of a upgrade and especially not for 700 Euro with a 30% performance lead, better to wait and well the rest of this aging x79 hardware is in due need of a replacement really. EDIT: Hmm so overall the GPU situation here is a bit funny at least for AMD but I guess Vega is soon hitting EOL similar to Pascal for NVIDIA and it'll be a bit of a price crash when that happens as stores start selling off what inventory remains. Actually was Pascal EOL'd maybe that just a misrumor again, I'll check on that eventually. Suppose fab wise AMD is still in with GloFo so there might be chips for covering additional cards even as 7nm(Sort of.) starts taking over and AMD is also using other plants now. EDIT: Yeah TSMC for the 7nm nodes from what I'm finding so that looks accurate at least but they are still dealing with GloFo and have supply from them. EDIT: Oh and right going EOL for production isn't going to affect driver support or stuff like that, suppose it's kinda obvious with the entire GCN chain still going strong from Gen1/1.0 to Gen5/1.5 and what VII here might using. Pfffft as per usual, the cheapest I can find over here (Netherlands) is $930 (including tax). Depends on which game but it beats the 2080 on a few of them. I think it's worth 700 bucks. I'll not buy it but it looks like it is actually priced right. I limit my GFX card buying to $300 or less. Truth is.. it does not beat the 2080 in MOST of the games. What new features does it come with vs the Vega 64... and a 1080TI is JUST as fast as the VII. When you can get a 2080 CHEAPER then the VII. It needs MORE power..it runs hotter and thats on the NEW 7nm chip. Has 16gb ram but.. so far 8gb is not holding anyone back.